As a young boy growing up in Ujjain, Harish Chandani remembers being fascinated by Shankar Mahadevan’s iconic song, Breathless. “It was around 2001 when the song was a huge hit on TV and it soon became the rage across the country. I remember practising it endlessly in my room and even performing it during a few local shows,” says the passionate musician as he reminisces about his initiation into the world of music. It was then the age of MTV and Channel V, when satellite TV beamed the best of contemporary pop and rock music into Indian living rooms. “In addition to Shankar Mahadevan, I was deeply influenced by artists such as A. R. Rahman, Lucky Ali, Sonu Nigam, Hariharan, Piyush Mishra and bands like Euphoria, Silk Route, Jal, Strings and Bombay Vikings which were quite big at that time. Moreover, my uncle loved old songs, especially the music of R. D. Burman and Kishore Kumar and their music was an integral part of the morning routine at home,” says the intrepid vocalist who looked forward to receiving an audio cassette from his friends and family every year on his birthday. As Deputy Manager, After Sales at Mahindra Truck & Bus Division in Pune, Harish’s day job involves solving critical analytical problems and ensuring a high level of customer satisfaction. However, after office hours, his evenings and weekends are filled with the rhythms of Jimi Hendrix, Eric Clapton, John Mayer, Steve Ray Vaughn and BB King. “My childhood was filled with diverse musical influences and my dream was to be a successful playback singer in films. But it was only in 2010 when I moved to Dehradun to pursue my Bachelors from the University of Petroleum & Energy Studies (UPES) that I was exposed to local acts and bands. Soon the musician in me began to stir. It was during this time that I discovered the love of my life, the guitar. I idolised people who could both sing as well as play this instrument. I then asked a senior to teach me the guitar,” says Harish who proved to be a quick learner and was soon teaching others the basics as well. He then went on to form a band with a pianist friend, Nishant Gailey and the two performed at various college festivals. Harish joined Mahindra in 2014 as a GET and soon started writing and composing his own music. “I was very inspired by the delicately knitted lyrics of Gulzar, Javed Akhtar, Amitabh Bhattacharya and Prasoon Joshi and began taking a keen interest in song writing,” he explains. It was in September 2014 that he bought a guitar, an amplifier and a mic from his first salary and set up a jam room in his apartment. 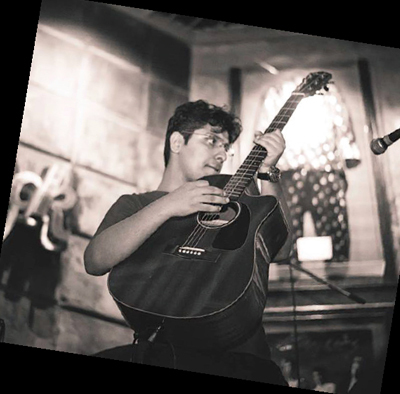 The talented musician soon formed a band, Naavik, with his colleague from Mahindra Powerol, Ashish Arora who was the lead guitarist, while Harish fronts rhythm guitar and vocals. 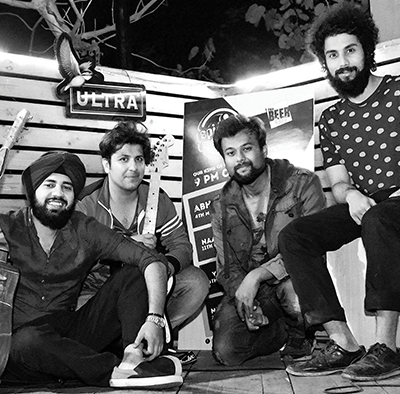 Other band mates include Vaibhav Dasare on percussion, drums and tabla and Dev Verma on bass. Naavik has a diverse range, playing everything from Rock & Blues, Funk, Pop and Soul to old Hindi numbers. “Each of these genres has something exciting to offer but it is Blues that resonates the most with me, as its mellow tones are really in sync with my personality,” says the Eric Clapton fan. Pune has a very vibrant music scene and there are plenty of opportunities for budding musicians and emerging artists at cafes and restobars. Currently, we perform two to three shows a month and also practise after office hours and on weekends. Naavik also performed to much acclaim at the 2016 Mahindra Rise Awards in Mumbai. “We decided to enter Mahindra Has Talent and uploaded a version of Coldplay’s Yellow as our entry. Our cover used tabla instead of drums. We were then selected to perform at the awards which proved to be a great experience. Our playlist for the evening consisted of a mix of old and new numbers which was greatly appreciated by the audience and after that day the momentum has just continued,” says Harish, the enthusiasm evident in his voice. Harish has also collaborated with various artists and bands in the past and one of his most notable collaborations was with Mahindra’s in-house band, Mystic Beats, with whom he composed a song on Mahindra’s KUV100 which the band performed at the vehicle’s engine launch. “Our efforts were much appreciated by our colleagues as well as senior management which was a matter of great pride for us,” he explains. So what next for this intrepid musician and his band? “Naavik would like to launch its own album and we are trying to produce an EP by December of this year but rather than the prospect of fame, it is the sheer love of music that drives our passion,” he signs off, the Beatles on his lips and Eric Clapton in his soul.